Swimming Pool Repair. Residential and Commercial Pool Repair. 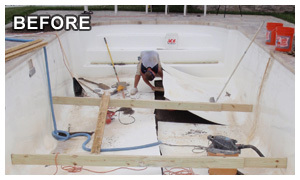 We have been using fiberglass resurfacing & refinishing technology to repair & resurface commercial swimming pools, residential swimming pools, pool & spa combos, hot tubs, fiberglass pool repairs, pool replastering needs and waterslides for over 23 years. 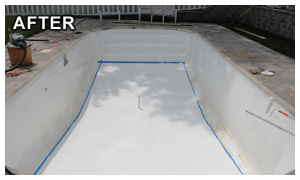 Our fiberglass swimming pool resurfacing and swimming pool repair materials are of the highest quality, and have been tested and updated to be as eco friendly as possible. It doesn't matter whether your swimming pool is a vinyl liner, indoor or inground we can offer the repair service you need to resurface, renovate and repair your pool. We offer the following products and services, fiberglass pool repair, gel coat repair, all fiberglass liners repaired ,slide repair, pool heaters, pool filters, pool chemicals, pool slides, pool pumps, safety covers, tile, coping, pavers, deck resurfacing, custom steps, handicapped accessible lifts, therapy pools, and more we are your one stop shop! Our portfolio consists of clients in Pennsylvania (PA), New Jersey (NJ), New York (NY), Florida (FL), Georgia (GA), South Carolina (SC), North Carolina (NC), West Virginia (WV), Virginia (VA), and Maryland (MD). Evaluate your existing swimming pool surface. Evaluate your swimming pool deck surface. Provide you with a FREE written estimate for your pool resurfacing, pool repair service and/or pool deck resurfacing project. Repair, resurface and refinish your swimming pool and/or resurface your swimming pool deck in a professional and expeditious manner. We are fully licensed and insured with all work covered by a full two year labor warranty. All resurfacing resin, fiberglass, and gel coat is warranted by the manufacturer. If you have any additional questions regarding your specific pool resurfacing & deck resurfacing needs just Ask the Pool Resurfacing Pro.